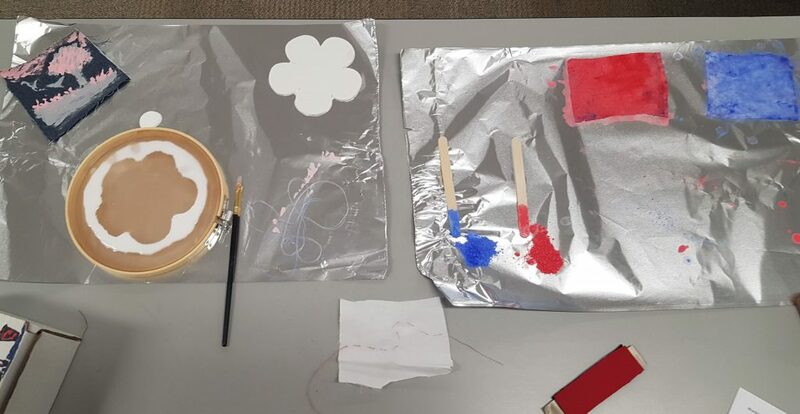 Today we worked with themochromic pigments in water and acryllic paint applications. The pigment changes from a coloured tone to white under heat and electric current as typically seen in novelty colour-changing mugs. My favorite example of the technology remains to be the CD version of the Nine Inch Nails album, Year Zero: when the CD is retrieved from a music player, the normally black disk becomes white and reveals hidden detailing. 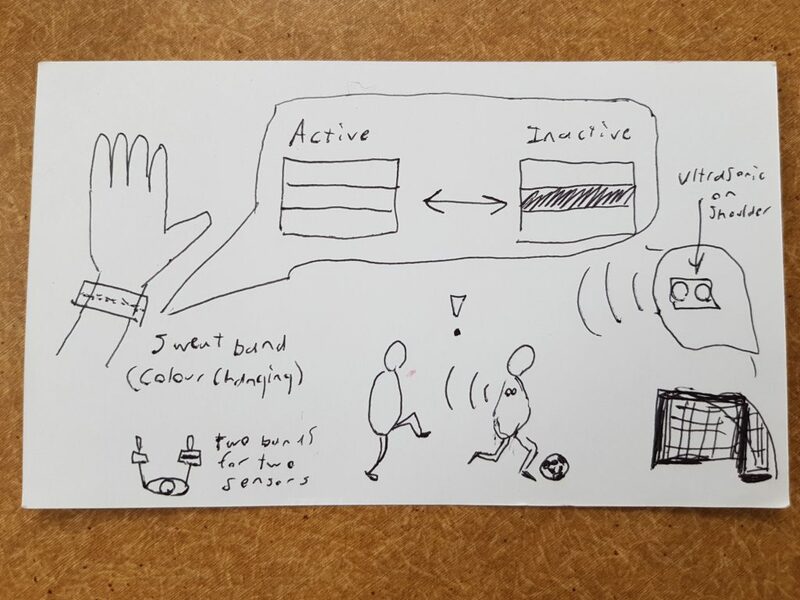 For the purpose of this workshop my idea is to use thermochromic-dyed sweatbands to indicate whether or not there is activity in a sports player’s blind spot within a particular distance. I imagine this could be accomplished with ultrasonic sensors, tuned to activate the bands whenever activity is detected within 10 feet of the user. Using two of such devices could bring an extra level of sensory detection that is visible within a player’s peripheral vision, providing warning of an unseen action before it happens, whether it be an opponent or an obstacle. For the purposes of conserving material, I decided to prototype this with the existing fabrics we created in class rather than purchase sweat bands for this one-use project. 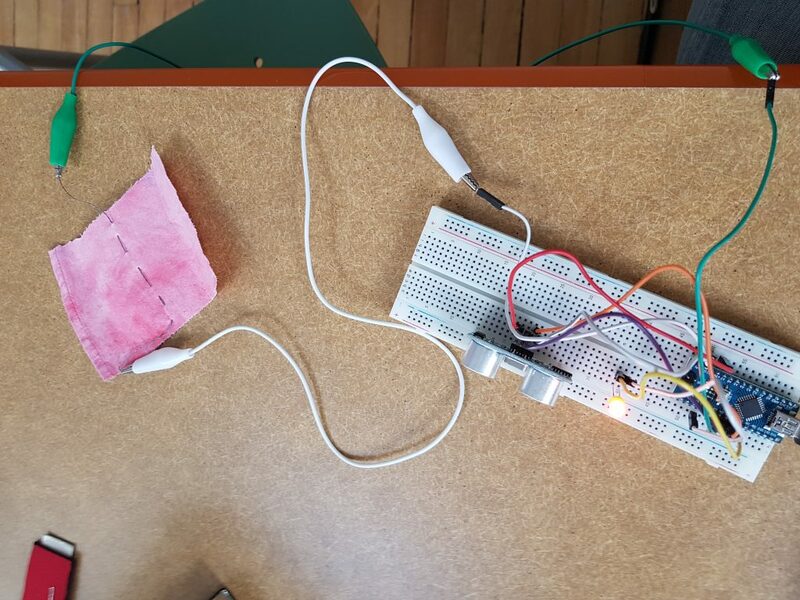 The programming was prepared with an Arduino and code that I slightly altered from an example for detecting proximity with the ultrasonic sensor (included at the top of this post). 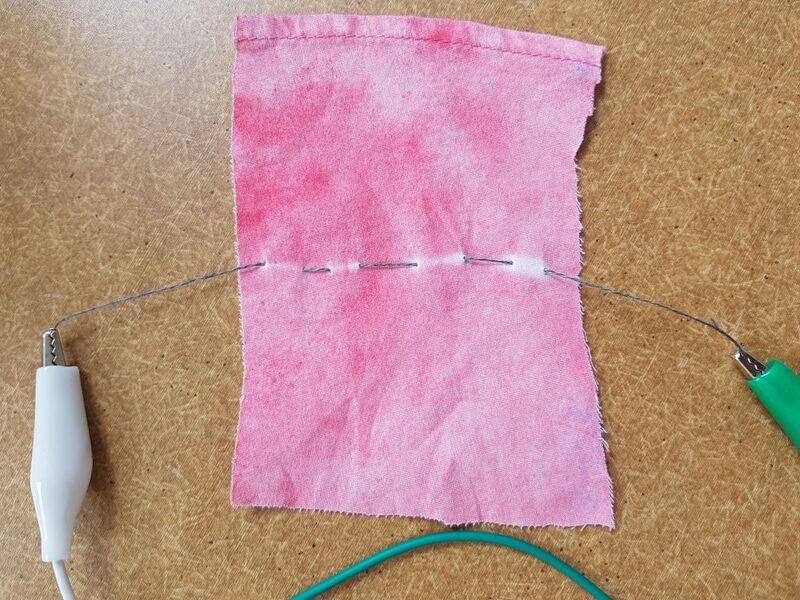 I sewed the thermochromic material with conductive thread and connected it to my circuit circuit: the device worked as expected, although based on testing the effect was more immediate with higher voltages (ergo, more heat caused by the electric current). 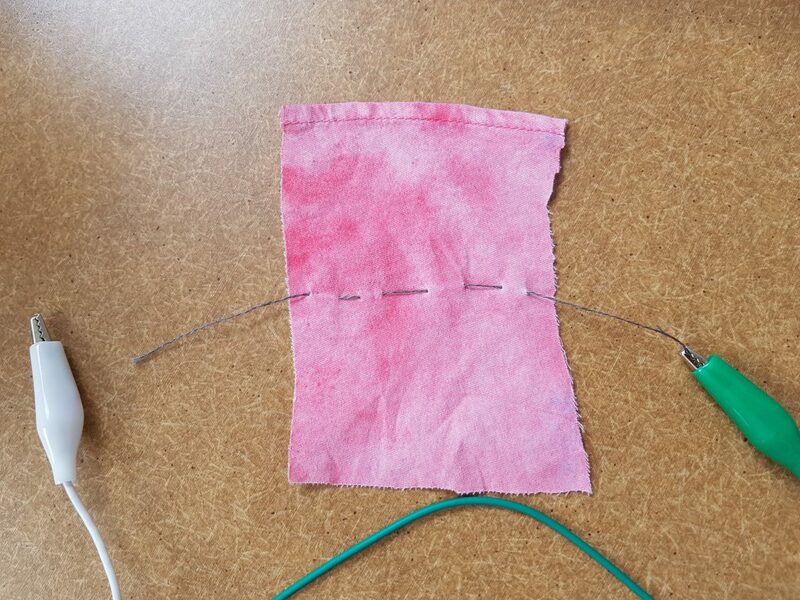 When the sensor was tested with a detection threshold of 10 feet, it behaved somewhat finnicky but was certainly activated enough to prove that it could work; signals that came into contact with fabric, reflectives and non-perpendicular angles caused irregularities. I’ve heard there are more reputable sensors available, perhaps worth looking into beyond the prototype stage. Naturally, were the device to advance to a proper prototypical state the sweat bands would need a means of communicating readily with the sensor without it being mounted directly to the sweatband (wireless?) and the thermochromic pigment would have to be modified to properly imbue itself in the sweat band with resistance to moisture. 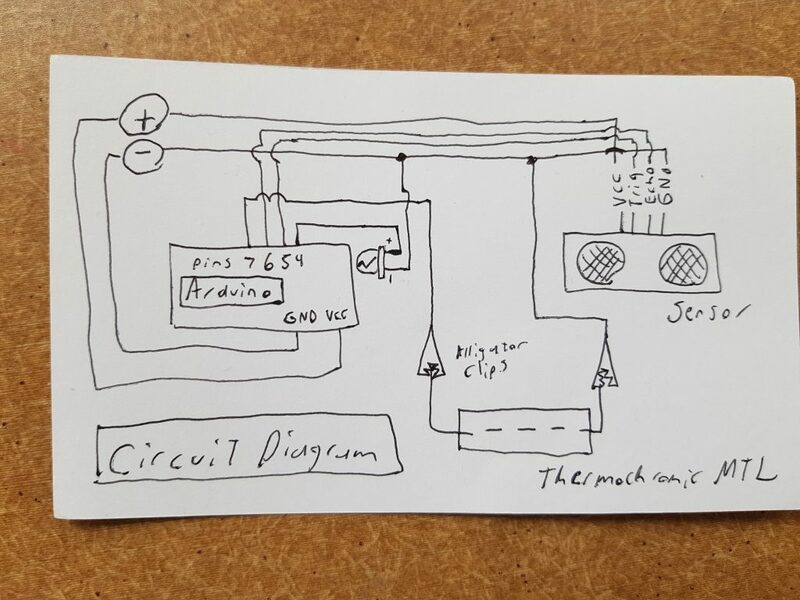 The voltage would have to be high enough to have the effect be noticeable within a certain timeframe, though we have also been warned about running the device for long hours due to the amount of heat generated by the circuitry. I don’t think that the material as-is is ready for such an environment, but I do think that thermochromic plastics would be effective paired with proper electrical regulation and protection mechanisms. All and all, this was a fun little excercise and I’m glad to have had the opportunity to try out the materials.